Sometimes artistic leanings slide sideways. My niece Cynthia Weber is an interior decorator, who exhibits an artistic flare that goes beyond her training. Her style is disciplined and “tuxedo”. She attributes her interest in creating beautiful spaces to spending time in our home when she was a child surrounded by Marilyn’s talent for mixing all elements of design in such a magical way. In addition to her thriving custom interiors business, Cynthia has taken over my catalogue of images. As of 2016 she holds the copyright to my entire body of work and I look forward to having her continue developing the reproduction & licensing aspects in the future. It is a lovely surprise in life when you meet once again, many years later, a person from your past. 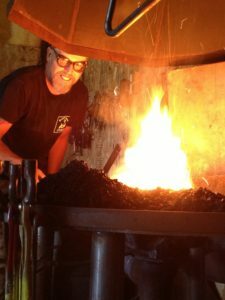 I was delighted to reconnect to a young man, Scott McKay, whom I had known when he was a child and to find out that he produces outstandingly beautiful metal sculpture. I won’t go on and on about his work but rather invite you to view his website.